INSUM integration into AC 800M supports higher functionality integration, multidrop configurations, time distribution and time stamping in the switchgear, and utilizes standard Ethernet technology for longer communication distances. The speed of this solution is typically 500 ms for one closed loop (indication from one motor until operation of another, assuming 250 ms cycle time in control execution). AC 800M controllers access the INSUM functions through function blocks in the INSUM Communication Library. 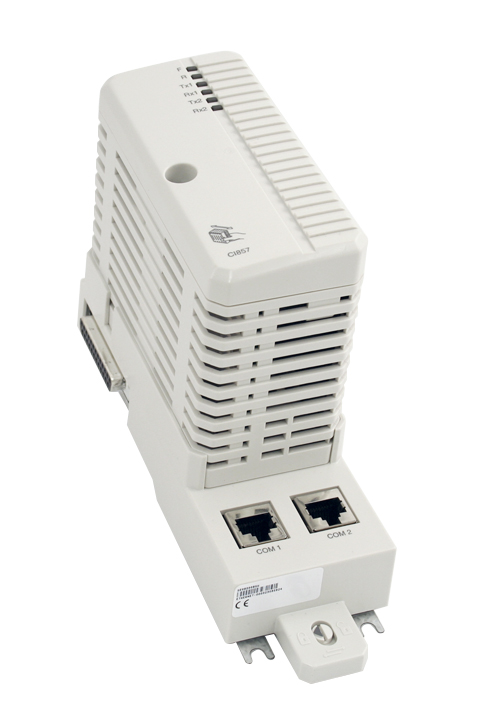 The CI857 is powered by the processor unit, via the CEX-Bus, and therefore does not require any additional external power source. Maximum number of MCUs (or other INSUM devices) per AC 800M: – 256 MCUs (or other INSUM devices) per AC 800M with PM864 or PM866. – 128 MCUs (or other INSUM devices) per AC 800M with PM861. Maximum 6 CI857 per AC 800M. Maximum 128 MCUs (or other INSUM devices) per CI857. Maximum 2 INSUM TCP/IP Gateways per CI857. Maximum 128 INSUM devices per INSUM TCP/IP gateway. Four LonWorks subnets per INSUM TCP/IP gateway. Maximum 32 devices per LonWorks subnet.